A few months ago, my pal Jennie and I went to one of the best little shops around, The Red Shed in Grapevine, Texas. We walked around and found a few things (at great prices) that we decided to buy and take home. 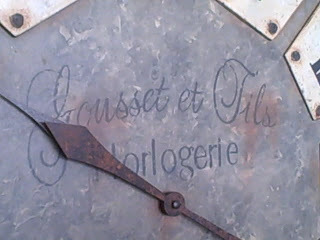 But there was this clock. I saw this clock and immediately loved it...but the price was too much for me. It was a great price but just more than I wanted to pay. So, I decided not to buy it...but couldn't get it out of my head. I went back a couple of times to see it again, even taking my husband to see it. Still, I just couldn't bring myself to buy it. I talked about it all the time. I told Jennie (who lives closer to Grapevine) if she ever stopped by the Red Shed and saw it for a certain price to buy it for me and I would pay her back. (I knew this wouldn't happen because the price I set was way too low). Every other day, I checked the Red Shed's website just to see it. Finally, last week, I emailed the Red Shed to ask about it again. 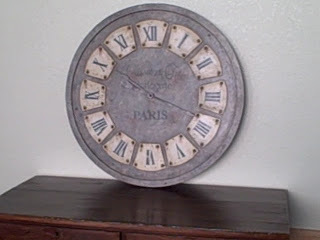 I found out it was a working clock (that's a bonus) and although it was a reproduction of a french antique, it was actually made in France by a french company that specializes in authentic french reproductions. That's good enough for me. I inquired again about the price and if it was still available and it was. So, I made the decision. On Saturday, I would go there and get it. On Thursday evening after work, I decided to quickly check my email. I see one from my pal, Jennie and clicked on it. The first thing I see is a picture of her son standing next to MY clock on HER wall. What? Then I read her email where she explained that she went to the Red Shed but the clock wasn't there which saddened her because she thought it was sold and knew how disappointed I would be but then saw it in a different place and was relieved. She found out that someone else was interested it because they had received an email about it. After checking, she found out the email was from me. So, Jennie bought it for a slightly lower price but not what I wanted to spend. She told me I could just give her the amount I wanted to spend if I still wanted it and she would cover the difference. What? That is so nice of her! She had no idea I had already decided to buy it regardless of the price. 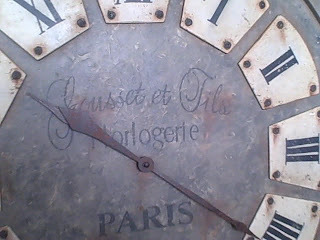 So, on Saturday, instead of going to the Red Shed, I went to Jennie's house and bought my clock. I love it. I found the perfect wall for it in my den in progress but still need to hang it. 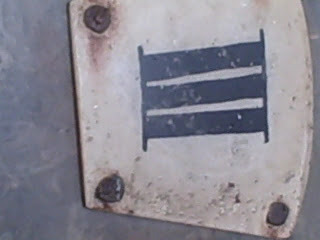 To see more great things, visit the Red Shed in Grapevine, Tx. We'll definitely be regulars there. In a future post, Jennie and I will show you more things we bought from there. How about the cutest ever $29. table that doesn't have to be repainted or anything! http://www.redshedonline.com/ Also read the inspiring story behind the Red Shed and their trips to Paris. It's actually made of wood with the most awesome paint job I've ever seen but it's perfect for me. I have clock envy! I love the clock and the Red Shed! Gina Hi, I just found your site from Funky Junk Interiors. I really like your site. I think we have similar styles. I enjoyed looking through several posts and I'm a new follower. it is awesome! thanks for sending me the link so i could read the story!